On 1/4/2010, new feed in tariffs (FITs) came into force for a range of renewable technologies. These tariffs are designed to encourage the installation of small scale renewable energy generators, by rewarding owners with payments based on the amount of power generated. The downside of this is the accompanying bureaucracy. In order to be eligible for the FITs, the installation needs to be carried out by a company registered with the Microgeneration Certification Scheme (MCS). 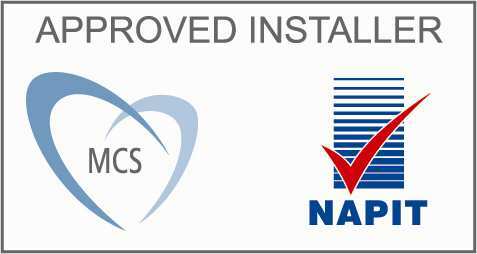 In view of this, Eco-nomical has created an MCS approved installation division called Economical Energy Solutions which installs MCS approved PV and ST systems. We are now actively carrying out installations in the West Midlands area, and hope to expand this range in the future. This is the pv array on the roof of the house of Eco-nomical employee Viv Marsh, in Ludlow. This array is predicted to provide just over 2900 kWh pa, which will translate to a payment of around £1200 pa. Exported electricity will provide a further £50. Also, the array will provide a saving of around £350 on annual electricity expenditure. On 1/4/2010, new feed in tariffs (FITs) came into force for a range of renewable technologies. These tariffs are designed to encourage the installation of small scale renewable energy generators, by rewarding owners with payments based on the amount of power generated. The downside of this is the accompanying bureaucracy. In order to be eligible for the FITs, the installation needs to be carried out by a company registered with the Microgeneration Certification Scheme (MCS). In view of this, Eco-nomical has decided, in conjunction with J W Solar Solutions to gain registration and offer installation services for Solar PV, and also Solar Thermal technologies. We are now actively carrying out installations in the West Midlands area, and hope to expend this range in the future. Return of 8 - 15% depending on (among other things) your current tax rate. FIT payments are linked to the Retail Prices Index (RPI), so are automatically compensated for inflation. Payments guaranteed for 25 years by the Government. A PV system will increase the value of your house (this is a bit of a bald statement, but wouldn't you pay a bit more for a house which came with a £1500 pa income stream, particularly when this income required absolutely no effort* or expense?). Compare all this with the paltry return currently available with conventional investments. A return of this magnitude in any normal investment would carry considerable risk, and probably require a fair bit of luck. * Pedant warning! Actually, you have to read the generation meter quarterly and report the reading by telephone, so maybe 20 minutes pretty easy effort per year is required. Contrary to popular belief, washing the panels is not required as the rain keeps them sufficiently clean to stay within a few percent of their peak output. Ideally, panels should be installed on an unshaded, roughly South facing roof. Approximately 140W is generated by each square metre, and typical domestic installations are between 1 and 3.5kW. Planning permission is not required unless you live in a listed building, or a conservation area or similar. PV systems are silent and maintenance free, and in addition to the panels only require a few switches, some wiring, and an inverter, which is a box which matches the output from the panels to the mains supply, about the size of a personal computer. Please contact us for more information and/or a quotation. 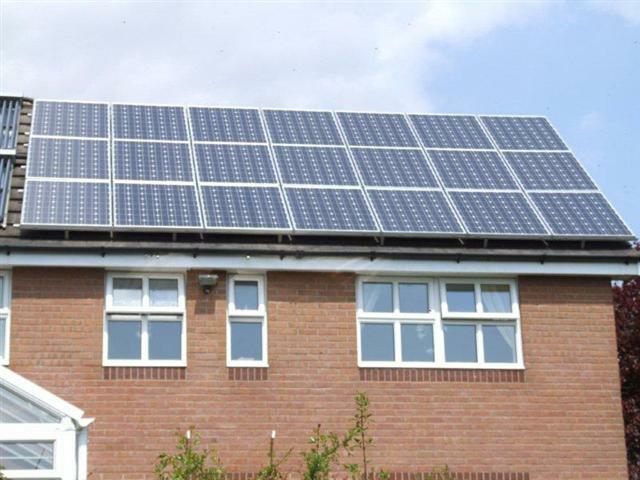 The FIT available for pv depends on the size of the system and whether the installation is a retrofit or on a new build. As can be seen from the table below, the largest payment is for a system of up to 4kW fitted onto an existing building. This figure is paid for electricity generated, even if is consumed by the householder. Send mail to SW@eco-nomical.co.uk with questions or comments about this web site.